1916 Now grown to 90 members. 1932 NATD started Medal Test system. National member Edgar Newton conceived this great idea. 1932 Alex Moore (the famous personality who later moved to the ISTD, started the world-wide Letter Service and became the third President of the International Council of Ballroom Dancing) was elected as the National's President. 1938 NATD initiated the Juvenile Championship at the Blackpool Dance Festival. Bob Garganico donated the trophy. 1939 NATD initiate the Junior Championship at the Blackpool Dance Festival. Gwen Silvester, sister of Victor Silvester, donated the Trophy. 1940 'Modern Ballroom Dancing' by Henry Jacques published. Most detailed analysis of technique ever. 1945 NATD initiates Student Tests in Ballroom. 1946 "Ballroom dancing for Amateur Tests" book issued by Carl Bryant. 1947 "Ballroom Dancing for Beginners" published by Frank Borrows. 1948 "Latin American Dancing" by Frank Borrows. This was the first comprehensive book on Latin dance. 1950 "Revised Technique Explained" book by Frank Borrows. This was a godsend for student professionals. Very logical. Saved hours in the learning of theory. 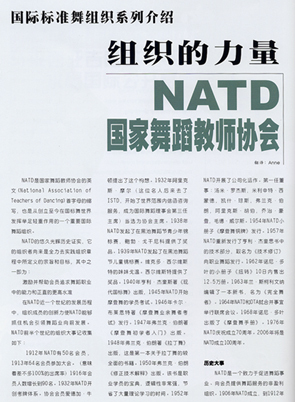 1952 NATD incorporated as a Limited Company. First directors: Tommy Rogers, Millicent Simmonds, Keith Jones, Frank Borrows, Alex Hooper, George Holden, Maude Wells. 1954 NATD booklet "Ballroom Dancing to Bronze Medal" issued. 1957 NATD re-issued the technical section of Henry Jacques book as a "Revised Technique" for professionals. 1962 Nornie Dwyer's "The Twist" booklet sold out a print run of 125,000 in ten days. 1963 Len Scrivener edits a new book, called the "Complete Dancer". 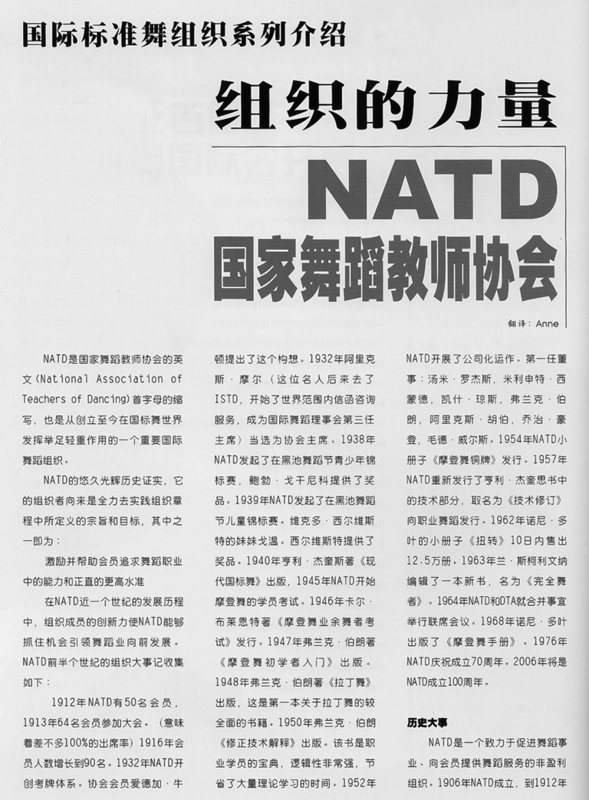 1964 NATD and DTA hold a Joint Conference with a view to amalgamation. 1968 Nornie Dwyer publishes a "Handbook of Modern Dancing". 2006 This will be the year of the NATD's Centenary. The National is a non-profit making body devoting itself to the promotion of dance and the provision of services to its members. Founded in 1906, by 1912 it had 50 members. Today the membership numbers around 2000. Originally devoted to set and sequence dancing based on the five positions of the ballet it not only kept pace with the changing trends of social dances through the years but its Council members were always quick to publish instructional and technical books on emerging trends. Many of the fundamentals of the dance business owe their origins to the creative thinking of the National's leaders. Towards the end of 1928 the National wrote to the doyen of the dance world, P J S Richardson, requesting that he call a conference, open to all teachers and associations, to discuss the possibility of them working in unison to teach uniform steps in the popular social dances. The resulting conference produced the setting-up of an "Informal Committee" which became established as Britain's 'Official Board of Ballroom Dancing', later changing its name to 'The British Council of Ballroom Dancing' and again to 'British Dance Council'. This last name change was again the result of a proposition by the National Association. Perhaps the National's greatest contribution to the business of dance teaching together with the progressive development of pupils was the introduction of Medal Tests. It was in 1932 that this idea germinated in the mind of Edgar Newton, a Council Member and one-time President, an innovation that has proved to be the mainstay of many schools and most associations. The three tests that the National started were originally called Bronze Seal at 5 shillings, Silver Seal at 10 shillings and Gold Seal at 15 shillings. (A shilling was one-twentieth of a £pound) Later the name was changed from 'Seal' to 'Medal'. A Diamond Star Test was started at 3 guineas (63 shillings) that aimed at the top echelons of amateur competitors. Even the lowest level of these tests was far from easy. In the late 1950's, Dave Jones of the National conceived the idea of Medallist Competitions. These were run in the form of graded events; i.e. entrants were restricted to events connected to their most recent medal award. This type of competition has developed into an excellent outlet for the schools and pupils of all associations. The Theatrical side of the National was also advancing strongly in the 1930s with the number of members increasing and developing specialist branches. In 1933 Maude Wells, ably assisted by Nina Hodgson, formed the National Tap Branch. 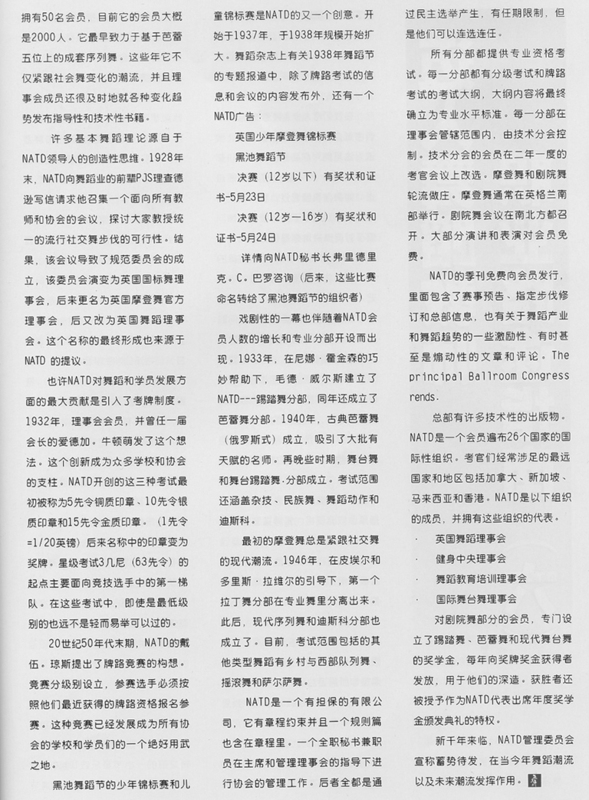 1933 also saw the establishment of the Ballet Branch. The Classical Ballet (Russian Method) was formed in 1940, attracting many famous and talented teachers. At a later stage, branches were created for Modern Stage and Stage Tap. Examinations are also available for Acrobatic, National Dance, Dance Movement and Disco. The original "Ballroom Branch" has always kept up with the modern trends of social dancing. In 1946 the first separate Latin American Branch within the profession was formed under the guidance of Pierre and Doris Lavelle. Since then branches in Modern Sequence and Disco have been added. Examinations are now available in other styles including Country & Western Line Dancing, Rock 'n' Roll and Salsa. The National Association of Teachers Dancing is a company limited by guarantee. Its Articles of Association control it and a Rule Book has been framed within those articles. A full-time secretary and staff under the direction of the President and the Council of management administer the Association. The latter are all democratically elected for a limited term of office but may offer themselves for re-election. Professional examinations are available in all branches. Each of these has a syllabus of graded examinations and medal tests which can eventually lead to professional standards. Each branch is controlled, under the jurisdiction of the Council, by a technical sub-committee, which is re-elected at the biennial Examiners Meetings; Ballroom alternating annually with Theatrical. The principal Ballroom Congress is usually held in the South of England. The Theatrical Congresses are held in both the North and the South. The majority of Lecture Days and Workshops are free to members. 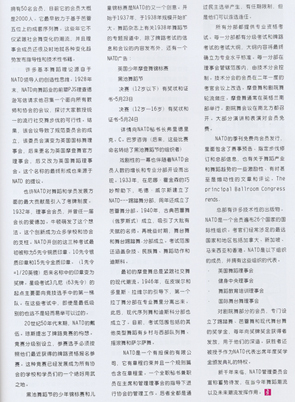 The association produces a quarterly magazine, issued free to all its members. This updates them on forthcoming events, syllabus revisions, and Head Office information. It also includes stimulating, sometimes provocative, articles and general comment on the dance business and dance trends. Scholarships for Tap, Ballet and Modern Stage Dance for the Theatrical members are held annually with the winners receiving attractive medals and cash awards to be used in furthering their training. The winners are also given the additional privilege of representing the Association in the annual Stage Dance Council's Scholarship Awards. The NATD Council of Management claims to be fully ready to deal with any emerging trends in dance that are emerging, or which may emerge, at the Association moves forward in the New Millennium.